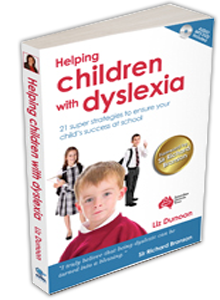 Three ways to support your child with dyslexia. 1. This book will help you to find the solutions you are looking for and put an action plan in place. 2. Reading spelling and self-confidence program. Guaranteed to work. Help your child catch up at school with their reading and spelling whilst improving their self-confidence. Powered by EasyVideoPlayer 2. Get your own player here. The Ten Minute Tutor is a daily 10 minute video streamed tutorial program, that uses a real teacher to help students catch up with their reading and spelling whilst increasing self confidence and self esteem. It can be used anywhere, at anytime, on any device with an internet connection. For more information on the program click below. A lobby group to communicate with the education ministers, for support and recognition of dyslexia in our schools. Leave your story or experience and it will be passed on to the relevant MP. "A bible for every parent of a dyslexic child. For me this book confirms you can never give up on your child's education, only you can protect them, no one else is going to do that for you, especially those children who aren't getting the right support in school. Helping Children With Dyslexia, confirms a lot I knew. It confirms to me how important it is to never rely on the School Education System. Too many qualified staff told me my son was doing fine. - Ha Ha, how wrong they were. I know so many parents who believe what they are told and their beautiful children slip through the net. Good luck I hope this book makes a difference for you. 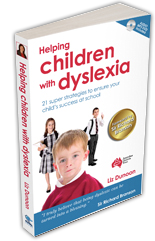 Not only a great read for a parent, but for those working with Dyslexia In Children." Many of the world's leading dyslexia experts gave there time freely to help write this book, because they understand the importance of parents and teachers having access to their information as it is the key to a struggling child's happiness and future success at school and in life. If your child is struggling at school they need you. With your help they can and will be a success. With this book and the strategies and knowledge it contains you can guide them through their formal schooling, encouraging them to find their true strengths and reach their full potential. Remember school is such a short time in your child's long life, yet what happens there can determine their future path. There are many great examples of world famous people with dyslexia who have gone on to achieve enormous success, perhaps none more famous that Sir Richard Branson, the founder of Virgin Airlines. He offered his support by writing the foreword for this book because as a dyslexic he knows all too well how important parents are in helping children to reach their full potential. You can provide this same support to your child and this book will show you how. "Every passing minute is another chance to turn your child's life around."